The evidence still seems to point to pesticides as the culprit in the demise of our precious bee population. It’s bad news, but at least we know, and we can do something about it. The world’s most widely used insecticide has for the first time been officially labelled an “unacceptable” danger to bees feeding on flowering crops. Environmental campaigners say the conclusion, by Europe’s leading food safety authority, sounds the “death knell” for the insect nerve agent. The Europeans are publishing study results on this issue. Now we need to get moving here in the US. Vote with your dollar: Support organic agriculture that keeps harmful chemicals out of the environment—and our bodies (and the bees’). Agricultural chemicals are wiping out bees that pollinate our crops and flowers. RODALE NEWS, EMMAUS, PA—Bee fan or not, we all rely on the insects to pollinate the fruit, nut, and vegetable crops we enjoy every day. But in the last few years, the populations of our pollinators, particularly honeybees, have been plummeting. Dubbed colony collapse disorder, the cause of the devastation isn’t known. There are many theories, from mites and viruses to cellphone towers. One potential cause—pesticides—gained more credibility this week with the release of a new study by Pennsylvania State University. 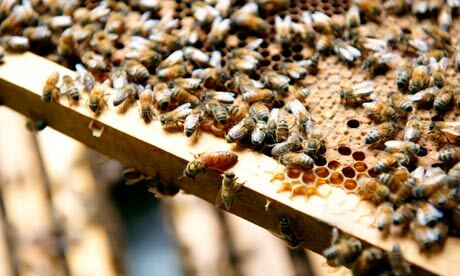 Researchers found “unprecedented levels” of pesticides in honeybees and hives in the United States. THE DETAILS: Scientists tested wax, trapped pollen, and honeybee specimens for chemical pesticides and chemicals originating from those pesticides. Investigating pesticide residue in samples taken from beekeepers from 23 states and one Canadian province during the 2007 to 2008 growing season, researchers found 121 different pesticides and metabolites in the 887 wax, pollen, bee, and hive samples. Nearly 60 percent of the 259 wax and 350 pollen samples contained at least one systemic pesticide—a type of poison that doesn’t remain on the surface of plants, but is taken up inside the plant, too, where honeybees go to feed. The way we interact with our environment is extremely important to every part of our health and our future. We can grow crops for use in foods and other products using synthetic chemicals as fertilizing and pest control techniques, or we can use natural fertilizing substances and natural pest control methods in our farming. The modern day tendency has been to use the “advances” offered to us by the chemical manufacturers as somehow better, convenient, and easy to use. But over time, it has become clear that pesticides were killing our birds and fish as well as the intended insect targets (refer to Silent Spring written by Rachel Carson). Chemical fertilizers have also contaminated our streams, rivers, and bays often causing harmful algae blooms that also kill valuable fish. Long ago it was found that the pesticide DDT (since banned by the US government) was infiltrating into our water supply and food chain to threaten human health. But today many, many more pesticides and artificial fertilizers are being released daily into our environment. Even worse, many of these chemical pollutants are very long-lived. Some, in fact, never break down into harmless components, but persist as dangers to all life on our planet for many years into the future. Fortunately, today many farmers and concerned citizens know that the more pure and natural approach to growing our food and herb crops is vital to reducing the chemical load on our land and on our bodies. When we farm the land with natural organic nutrients and balance pest populations with natural predators, we are protecting the environment from chemical pollutants that can have far-reaching negative consequences. Scientific research has also shown that organically grown foods and herbs have higher benefits and nutritional value. So organic products offer superior benefits for human health, and organic farming methods keep harmful chemicals out of our environment. Such a deal! As consumers, when we purchase anything, we are giving our support to the company and methods used to produce the product. If we buy the chemically produced products, those companies will thrive and continue to use methods that are unsafe for our health and our Earth. If, however, we choose the organically produced products, we are supporting the farmers and processors who are using safer, natural processes that protect our health and the health of our Earth. So every day, we make choices that can make a difference. We should always look for the organic choice whenever possible to encourage conservation of a clean and natural environment for ourselves and our future generations. And we really need to pick the healthier choice for our own bodies and the bodies of our loved ones. Organic personal care products have become the specific focus of my recent efforts. I don’t think that most people realize how many dangerous chemicals we are putting on our skin and hair and into our mouth every day. When I became aware of it, I was truly shocked. It’s actually very hard to even find a shampoo, body lotion, or toothpaste that doesn’t contain harmful chemicals. Fortunately, there is a terrific non-profit organization that publishes extensive information about harmful chemicals and which products are safer. It is called the Environmental Working Group at www.ewg.org and the Campaign for Safe Cosmetics at www.safecosmetics.org. Also, people need to be aware that the skin is the largest organ of the human body. Our skin is designed to transfer some substances out of and into the body. We have pores in our skin that reach down into the bottom layers of skin to enable us to perspire when we are too warm. And the top layer of our skin is constantly throwing off old dead skin cells, while the new cells rise up toward the surface. So the surface of our skin with its pores to the inside is very open to outside substances. We all know that Vitamin D is absorbed through our skin just from sunshine. It’s easy to see for yourself how a light lotion placed on your hand or arm very quickly disappears into your skin and body. Therefore personal care products are a very important component of our health care for our bodies. And my personal experience is that organic products feel better on my body, make my hair clean, soft, and shiny, and get my teeth cleaner. I can tell that these products are actually healthier and work better than the products that I had used in the past. I have spent years searching for the very best in organically produced products. In the summer of 2007, when I found ONEgroup, I was thrilled. I immediately bought samples and then I got REALLY excited. Their products have all been the very best performing products of any kind that I’ve ever tried. So, I became an Independent Representative for ONEgroup’s three brands, MiEssence, MiEnviron, and MiVitality. I’m sort of a “retired” old lady, and I’m so happy that I have found such a wonderful work for the later years of my life. Take a look at some of my website if you have time. And I’ll work on blogging about the products in this location. We wish you and your loved ones Health and Happiness!